“Do you want to see the railway station? The charred remains of coaches?” enquires a local who runs a shop next to the station in Godhra, headquarters of Panch Mahal district, which will go to the polls on 14 December. “It's almost like a ritual. Every media person who comes here starts from the railway station as if it is some kind of a monument,” he continues. In Gujarat's Godhra, 2002 is a still bitter memory. Local Muslims steer away from discussing it, and even more so around election time. Over the lost two elections, it had been Congress' CK Raulji who emerged as the winner. However, Raulji, who was an MLA twice in the 1990s when he was with the BJP, has joined hands once again with the party. Congress, meanwhile, has fielded Rajendra Sinh Parmar. But it is the entry of local surgeon Jaswant Sinh Parmar in the electoral fray which has made the contest exciting. An old BJP-RSS hand, he was considered the party’s choice for the polls till CK Raulji decided to join the BJP once again once the Congress expelled him and 13 other MLAs for six years for voting against Ahmed Patel in the Rajya Sabha polls. Jaswant Sinh Parmar is a strong OBC face and has been preparing for the election in the region for a long time. His entry is expected to play spoilsport for both BJP and Congress candidates. “For the BJP, because he comes from the party, a lot of local workers are unhappy over him being denied a ticket. For the Congress, he could cause trouble because he is also a Parmar, a community which has a sizeable presence in the area,” a local explained. “Since 2002, the city has suffered and so has the community,” says Rehman Bhai, a local businessman. “Our difficulties have only increased." The constituency of Godhra has a more than 50,000-strong Muslim population, most of whom largely belong to the Ghanchi community. “Why does nobody discuss the lack of development here?” asks Mohsin Maulvi, a young student. “Look at that road. It was built in 2005 and then again only five days back. Look at its condition now,” he says pointing to a road in Muslim-dominated Station Road neighbourhood. Nothing about the road looks new. Godhra, has been peaceful for the last many years, Aamir Patel, a young businessman, says. “The city is divided into Hindu and Muslim neighbourhoods. But most Hindu shops have Muslim workers, and a lot of Muslims have their shops in Hindu neighbourhoods,” he explains, pointing towards the local market. “We want jobs. It has been two years since I completed my post graduation and I still do not have a job,” Tildi Zubair intervenes. 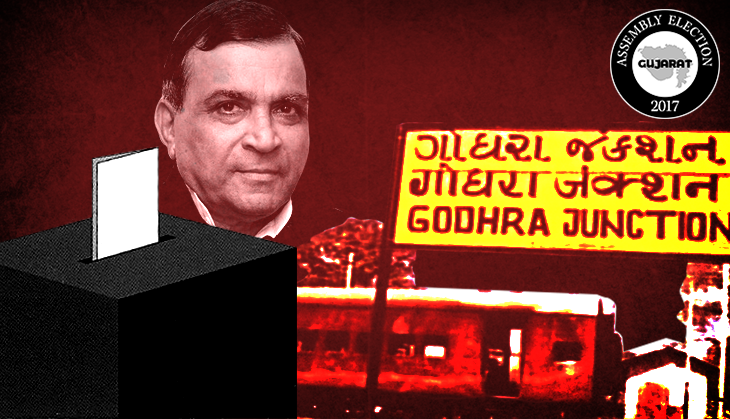 “Godhra has no proper education institutions. A government engineering college was established just two years ago. There is a civil hospital which isn't properly equipped,” he complains. Most youngsters have to go to Baroda, Anand or other cities for education. For Idris, a local farmer, it is the stagnant prices of crops which have caused maximum discomfit. “To add to it they have introduced the Goods and Services Tax (GST),” he says. Yet, for the Muslims, it is fear of a polarised election which dogs them the most. "For the last two-three days the BJP has whipped up issues with communal overtones. Look how they brought up Ahmed Patel as CM rumour," Mahfooz Patel, a local Congress leader says. “The other day, the Congress candidate was supposed to address a Sabha in one of the Muslim localities. But he cancelled at the last moment,” a Congress worker says. “He did not come because he feared that on a day when Mani Shankar Aiyar’s comments on Prime Minister Modi are in the headlines, being seen with the ‘topi walas’ could upset his chances,” Altaf Bhai, a lawyer who is close to the Congress, claims. “We understand his problem,” Altaf says, adding how the Congress knows that this region will vote for the party irrespective of the candidate. The BJP candidate has not even cared to visit the locality this time. “He has instead started talking in the same communal tone,” Altaf claims. Aamir Patel claims people are angry with Raulji for deserting the Congress. Moreover, social media has become a potent anti-BJP force. “In the last elections, it were the Patels who set the anti-Congress mood. They were the ones most aggressive on social media too, because they are moneyed,” Rehman Bhai says. “This time they are opposing the BJP,” he continued. But BJP is confident that it will wrest Godhra from Congress this time. “The independent candidate will not have an impact,” Rakesh Thakor, a local lawyer close to the BJP says. “It is the symbol which is important not the individual,” he says. “The last time we only lost by 3,000 votes,” Thakur points out. "The ideology of the party will make people vote for us again."